Washington Commemorates 125 Years of Statehood on November 11, 2014! 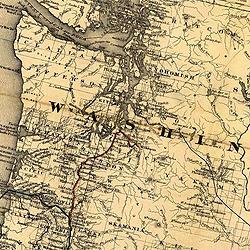 Washington became a separate territory from Oregon on March 2, 1853. Washington Territory drafted a constitution in 1878 through the Walla Walla Constitutional Convention in 1878, but it was rejected by Congress. In 1989, Washington commemorated the Centennial of Statehood in a big way with projects and programs throughout the state. Each county participated and many state agencies participated as well. After the State Constitution was approved by a vote of the elected officers in Washington, a certified copy was sent to President Harrison for his approval before Washington could be proclaimed a state. Days went by and no word. On November 4, 1889, a message was received that Governor Moore forgot to sign the Consititution and President Harrison could not approve it. Overnight, a new copy was prepared in long-hand (no copiers back then), and it was sent to the President by the courier the next day. The President was then able to declare Washington's Constitution approved and the State of Washington was admitted to the Union on November 11, 1889.